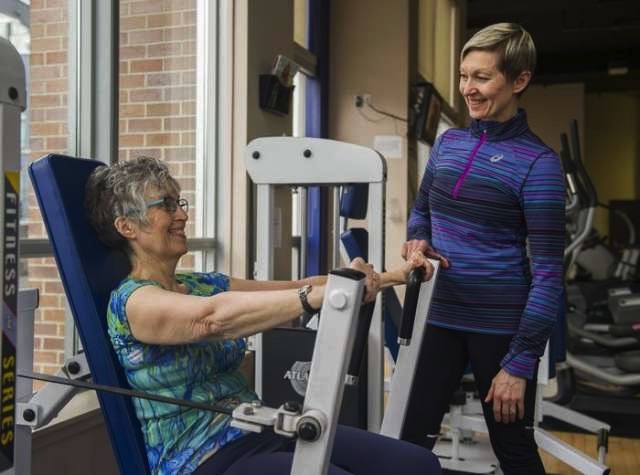 Personal trainer Svetlana Pelletier works with Lois Keebler, 69, in Vancouver to improve her balance, muscle strength and bone density through resistance training. Keebler says she recently started to slip on an icy sidewalk, but was able to right herself without hitting the ground. She credits that to better balance and overall fitness. 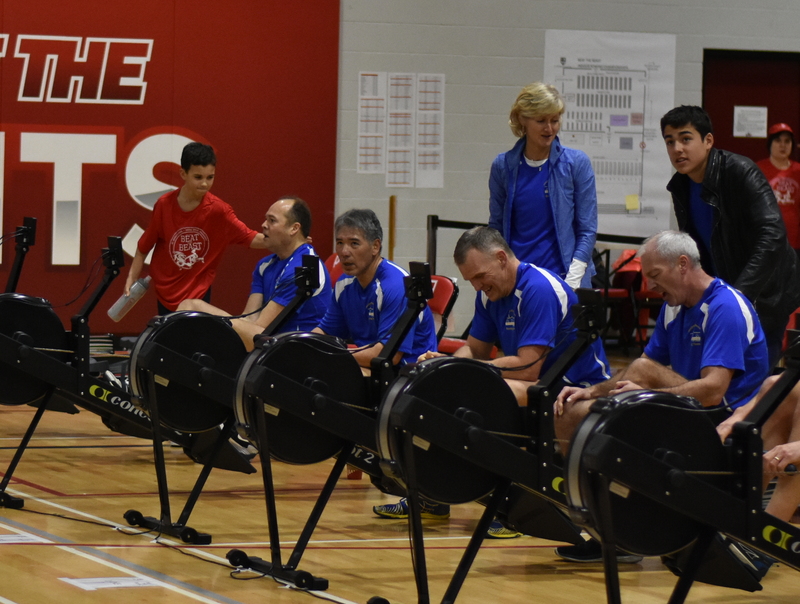 With half of Canadians over 40, simple demographics have put exercise geared to older adults on the last three annual top-10 list of fitness trends compiled by Canfitpro, a national training and certification company for fitness professionals. 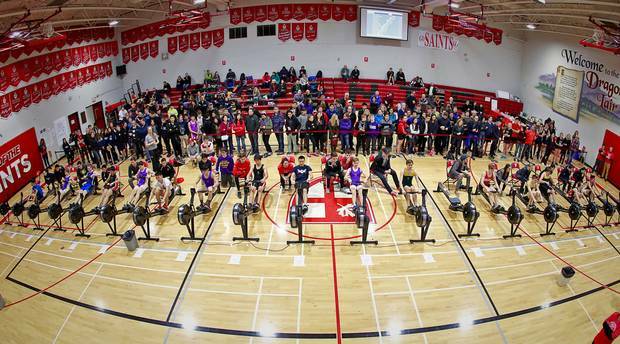 “From a business perspective, it’s at that stage where you can’t really ignore that market anymore,” says Colin Milner, CEO of the Vancouver-based International Council on Active Aging, an organization that promotes healthy living after middle age. It’s also linked to a change in the way we define healthy aging more in terms of keeping as active as possible rather than the absence of disease, Milner says. Fitness goals vary widely, from people who have stuck with a vigorous routine for years to others who want to garden, play with grandchildren or get up off the floor if they need to, he says. 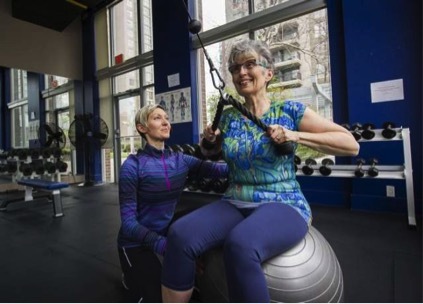 Svetlana Peltier is a Vancouver personal trainer with BodyAge Fitness who has specialized in working with older adults for about half of her 30 years in the industry. She says she’s observed more interest among both clients and trainers, particularly as people retire to the West Coast specifically because they can be outside more to play sports or enjoy nature. “It’s a perfect environment to maintain a healthy lifestyle,” she says. This entry was posted in Fitness Blog on March 20, 2017 by bodyagefitness. And since social media has become such an integral part of most people’s lives, we have the opportunity to quickly find out about these Health & Fitness Superstar and be motivated by the fact that the studies are proving that “Consistency of training” is the main explanation for their amazing results! Regular workouts and the enjoyment of being active. I found it somewhat refreshing to realize this fact. I have just turned 50 and I, DEFINITELY, want to be fit and active for many, many… more years. To read that Robert Marchand was able to increase his VO2 capacity after the age of 100 by following a systematic training plan had a major impact on how I have started to look at my present training plan. The statement “ I am in this for the long haul” has a whole new meaning to me. I hope the little post will also make you realize that Consistency of training is definitely the key to long term Health & Fitness. Get out there and have fun working out! This entry was posted in Fitness Blog on March 1, 2017 by bodyagefitness. This year, I decided to compare my very first Polar Bodyage Assessment ( 2004) to my present assessment. 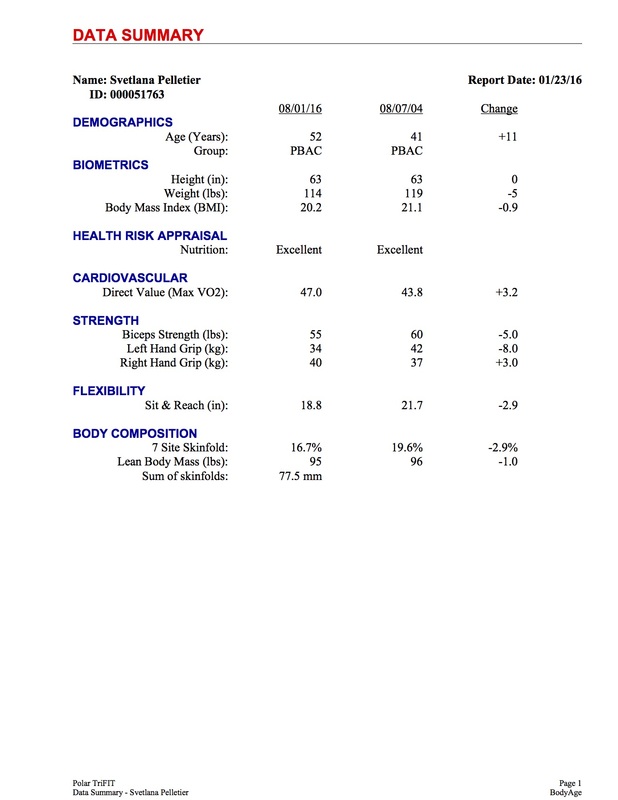 Our Polar Bodyage Assessment uses a combination of assessments (strength, flexibility, cardio-vascular (VO2), body composition, girth measurements and nutrition) to calculate your body’s present biological age compare to your chronological age. 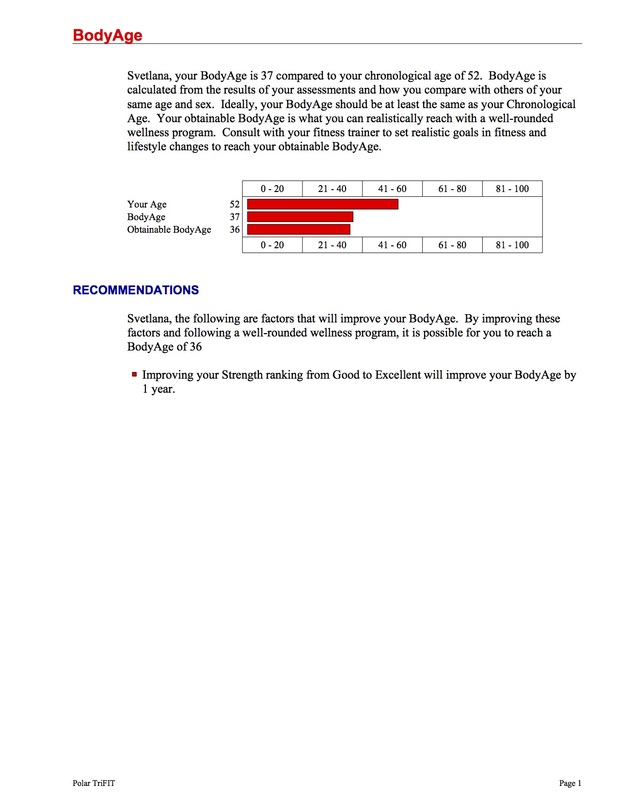 As you are able to see from the results of my assessment, the goal is to maintain as low a Biological Bodyage as possible. What I have done to have a biological bodyage 15 years younger than my chronological age is not a secret. I lift weights 2 to 3 times per week. I enjoy lifting heavy weights and this has never made my body look bulky. The regular weight lifting has kept my muscles lean and strong. Due to the hormonal changes which happened during the last 10 years, I had to re-examine my food intake and I am much more aware of the type of nutrition which best suits my body type. I have used vitamins and supplements for the majority of my life and this last year, I have discovered and began to use many wonderful nutritional and age defying products from Isagenix. I believe that two of the secrets of a long healthy life is be positive and to wake up every morning with a purpose for the day. FIND PURPOSE IN YOUR LIFE. STAY ACTIVE, HEALTHY AND YOUNG. This entry was posted in Fitness Blog on January 24, 2016 by bodyagefitness. November is here! The days get shorter, colder and it rains more. There just seem to be less opportunity to exercise on a regular basis, right? And then soon, there will be all the Christmas parties… Finally, by the end of January 2016, the number on the scale will much higher than they were last summer. We all know the story. Every year it happens to some of us. Let’s change the script of the story this year and make it a goal to keep your body weight within 1 to 2% of your pre-winter level. Deal?? Drink more water: Being well hydrated is always important but drinking extra water will help in curbing your appetite. 2 glasses of water before leaving for a holiday party will be a valuable ally in controlling your caloric intake and also help counteract the dehydrating effect of alcohol. Never arrive at a party hungry: Planning ahead and eating a small amount of food before you leave will help you maintain your discipline and avoid the temptation to over-indulge on the goodies. Take it easy on the starches and instead go for the fruits/veggies and lean meat/seafoods: When looking at the buffet table, pass on the breads, white rice, sauces, cookies, cakes… and pick more tomatoes, peppers, grapes, kiwis, chicken bites, shrimps… They are all very tasty and much lower calories per bites. Pace yourself when eating: Since you will not be hungry when you arrive, there is no need to try to eat as much as you can in the first half hour of the party. Try to sample only 1 item at the time and walk around the room to talk to different people instead of standing by the same table and picking food from it consistently. Please limit the drinking of alcoholic drinks to one serving: In case you did not know, wine, beer and other alcohol all contain between 100 to over 200 calories per serving. And since alcoholic drinks are usually paired with food, these extra calories quickly add up. Get plenty of sleep: Research has proven that not getting 8 hours of quality sleep will affect your body’s insulin and ghrelin (hunger hormone) levels, leading to overeating. Improving the quality and duration of your sleep will enhances growth hormone release and helps your immune system stay strong. And of course, there is the “exercise before/after you go out to the party”: By burning some calories through a cardio-vascular and/or resistance training workout, you will indeed create a small caloric deficit and you may then indulge in one maybe 2 of your favourite treats! Stay fit and lean this winter! Your body will thank you for it. Eat Smarter – Train Better! This entry was posted in Fitness Blog on November 12, 2015 by bodyagefitness. EATING THE MOST IMPORTANT MEAL OF THE DAY, EVERYDAY: BEAKFAST! In our household, the first thing we NEED to do every morning is eat breakfast. Our bodies & minds are calling/begging for some nutrition. We are still amazed as to the numbers of people we meet and begin to train who tells us they have not eaten breakfast for many years. People, it is time to change this. Here is why! Studies have showed that people who skip breakfast have a metabolic rate four to five percent below normal, which may lead to an expected weight gain of eight pounds per year (one pound every seven weeks). People who do not eat breakfast have showed to choose less nutritious and convenience foods to curb their appetite. Poor eating choices will often lead to eating throughout the evening and calories are stored as fat during the evening hours as your metabolism does naturally slows down each evening. All research have showed that people who eat breakfast have higher energy levels, during the day, and often engage in more physical activity than people who don’t. There you go folks. Above are 4 great reasons why you should indeed, eat breakfast every single day. If you are one of these people who have not eaten breakfast for awhile, starts slowly and small. A blended liquid protein shake with whey protein, your favourite fruit and some healthy fats is a great way to start! Remember that Healthy Body = Healthy Mind = Longer Healthier Life! This entry was posted in Fitness Blog on October 2, 2015 by bodyagefitness.